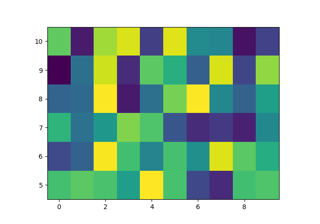 Create a pseudocolor plot with a non-regular rectangular grid. X and Y can be used to specify the corners of the quadrilaterals. pcolormesh is similar to pcolor. It's much faster and preferred in most cases. For a detailed discussion on the differences see Differences between pcolor() and pcolormesh(). A scalar 2-D array. The values will be color-mapped. Note that the column index corresponds to the x-coordinate, and the row index corresponds to y. For details, see the Notes section below. The dimensions of X and Y should be one greater than those of C. Alternatively, X, Y and C may have equal dimensions, in which case the last row and column of C will be ignored. If X and/or Y are 1-D arrays or column vectors they will be expanded as needed into the appropriate 2-D arrays, making a rectangular grid. A Colormap instance or registered colormap name. The colormap maps the C values to colors. Defaults to rcParams["image.cmap"]. The Normalize instance scales the data values to the canonical colormap range [0, 1] for mapping to colors. By default, the data range is mapped to the colorbar range using linear scaling. The colorbar range. If None, suitable min/max values are automatically chosen by the Normalize instance (defaults to the respective min/max values of C in case of the default linear scaling). 'none' or '': No edge. None: rcParams["patch.edgecolor"] will be used. Note that currently rcParams["patch.force_edgecolor"] has to be True for this to work. 'face': Use the adjacent face color. An mpl color or sequence of colors will set the edge color. The singular form edgecolor works as an alias. 'flat': A solid color is used for each quad. The color of the quad (i, j), (i+1, j), (i, j+1), (i+1, j+1) is given by C[i,j]. 'gouraud': Each quad will be Gouraud shaded: The color of the corners (i', j') are given by C[i',j']. The color values of the area in between is interpolated from the corner values. When Gouraud shading is used, edgecolors is ignored. Whether to snap the mesh to pixel boundaries. An alternative implementation with slightly different features. For a detailed discussion on the differences see Differences between pcolor() and pcolormesh(). If X and Y are each equidistant, imshow can be a faster alternative. 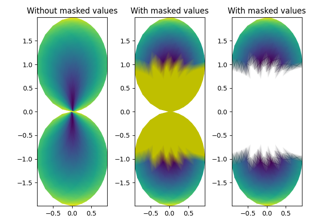 C may be a masked array. If C[i, j] is masked, the corresponding quadrilateral will be transparent. Masking of X and Y is not supported. Use pcolor if you need this functionality. The grid orientation follows the standard matrix convention: An array C with shape (nrows, ncolumns) is plotted with the column number as X and the row number as Y. 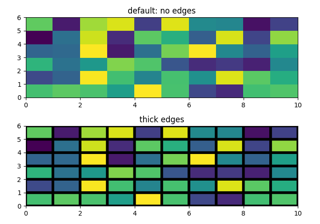 Both methods are used to create a pseudocolor plot of a 2-D array using quadrilaterals. The main difference lies in the created object and internal data handling: While pcolor returns a PolyCollection, pcolormesh returns a QuadMesh. The latter is more specialized for the given purpose and thus is faster. It should almost always be preferred. There is also a slight difference in the handling of masked arrays. Both pcolor and pcolormesh support masked arrays for C. However, only pcolor supports masked arrays for X and Y. The reason lies in the internal handling of the masked values. pcolor leaves out the respective polygons from the PolyCollection. pcolormesh sets the facecolor of the masked elements to transparent. You can see the difference when using edgecolors. While all edges are drawn irrespective of masking in a QuadMesh, the edge between two adjacent masked quadrilaterals in pcolor is not drawn as the corresponding polygons do not exist in the PolyCollection. Another difference is the support of Gouraud shading in pcolormesh, which is not available with pcolor. All positional and all keyword arguments.